This is what happens when two ideas for a Series collide… Anyone who texts often, might recognize the “143” as being “I Love You”, as I is one (1) letter, Love is four (4) letters and You is three (3) letters. The second part, which was actually the primary focus, is about how we think – whether that be positively or negatively – as it does have the tendency to show up in how we carry out our actions. The particular item that the concept was pulled from was concerning “depression”, the part of which we can change ourselves, not the chemical challenge which we can do little about until the cause of the imbalance can be discovered and treated. 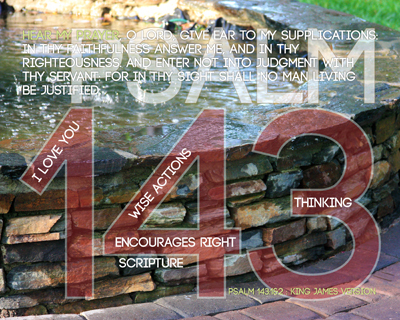 Scripture | says Wise Actions, Encourages Right Thinking. For me it is a little more than that, because Psalm 143 is an entire chapter in the Bible about how to think, amidst deep trouble – the Word of God shows us that God Loves Us – if we will keep our minds in the Word, then the influence it has on whatever the world can throw at us, is lessened, if not we get completely knocked aside. The more we stay there, the more capability it gives us to withstand and easily discern between evil and good – for every intention. What has your thinking today? Did you wake up with fret, fear or worry? Was it over a situation that is under your control? Most of us would have to confess, I know I would, that there have been too many mornings that I’ve gotten up and not had that first thought be “Thank You, Lord…” But, am here to tell you that those days are fewer and fewer, because I “want” to Think like Christ in, for, around and about every situation in my life. Now you may not have the reminder in your head like I do to help you “remember” it, but we each have things we pour into our senses that affect our Walk and Relationship with our Saviour. Each verse, chapter and book of the Bible is provided to us because He Loves Us – notice I didn’t put Loved. His Love is Active, thus so should be our thinking, in Him as we go about our daily lives. Our responses WILL change – whatever you get saturated with, will naturally come oozing out of you (oozing in a good way…), impacting everything you do and everyone’s lives you touch. Spend more time in His Word and be sure to remember – it is provided to us through Love. It is our Love Letter. Just as David shared in Psalm 143, out of our circumstances can come some of our darkest hours, but we can take them to the Lord in Prayer. Honestly addressing what we have fear of, will make it known unto an All Knowing God, who desires to hear from us. He wouldn’t have supplied the book to be built of His Word for nothing – it is meant for everything. The twelve (12) Series prints are provided in two sections – one for Psalms and the second for other supporting verses. While there are so many things that we have no control over or to do with, there are those many things that we can – especially our daily walk and relationship with our Lord and Saviour Jesus Christ. I have NO way of telling you or anyone how things will work out for any given situation, but what I can tell you is that the more I stay in His Book, the Bible, the less those things have control over me – whether that be mentally, physically or in position. There are things that are out of our control – for those things we may need to seek wise counsel with a physician, but by a wide majority of the time, we are the influencing agent of the trouble we bring upon ourselves. Make Him the priority in your life and all of that stuff will begin to change – then you will have this different way of thinking Encouraged by the One who Changed the course of Eternity, Who can Change Anything we are facing today.